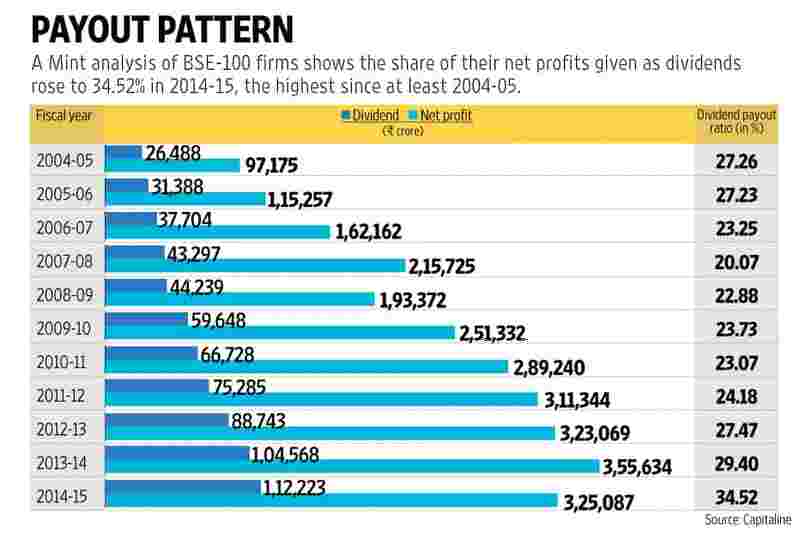 Mumbai: Indian companies rewarded their shareholders in 2014-15 with the biggest chunk of their profits in at least 11 years as they saw no reason in saving the money for capital expenditure in an economy starved of demand, data showed. A Mint analysis of BSE-100 companies based on Capitaline data found that their dividend payment ratio—the share of net profits given as dividends—rose to 34.52% in 2014-15. This is the highest such figure since at least 2004-05. Of these 100 companies, the dividend payout ratio of 78 private companies rose to 34.02%—the highest in at least 11 years—while that of 22 state-run companies fell slightly to 35.40% from 38.49% a year before, still the second highest in at least 11 years. “Some of the private companies have not seen any major profit growth, and since there were no immediate capex plans, some of them opted to reward the shareholders," said Dipen Shah, head of private client group research at Kotak Securities Ltd. According to the provisional estimates released by the Central Statistics Office, India’s gross domestic product grew 7.3% in 2014-15, a tad lower than the advance estimate of 7.4% released in February. However, corporate earnings do not reflect such a scorching pace of growth, suggesting activity on the ground level has not picked up. According to Dhananjay Sinha, head of research at Emkay Global Financial Services Ltd, the dividend payout ratio was possibly higher also because 2014-15 earnings were lower. Earnings of the 30 companies in BSE’s equity benchmark Sensex fell 9% in the March quarter, compared to an estimated 3% fall, Motilal Oswal Financial Services Ltd said in a 4 June report. Cyclical stocks disappointed the most. Of all the companies in the BSE-100 index that declared their fourth-quarter earnings, 52% failed to meet market expectations, while only 33% beat expectations, Barclays Plc’s Indian branch said in a report on 1 June. The bank said all sectors have seen downgrades to 2015-16 earnings per share (EPS) estimates since 1 April, and sectors have seen downward revisions to 2015-16 EPS growth estimates since the start of the earnings season. 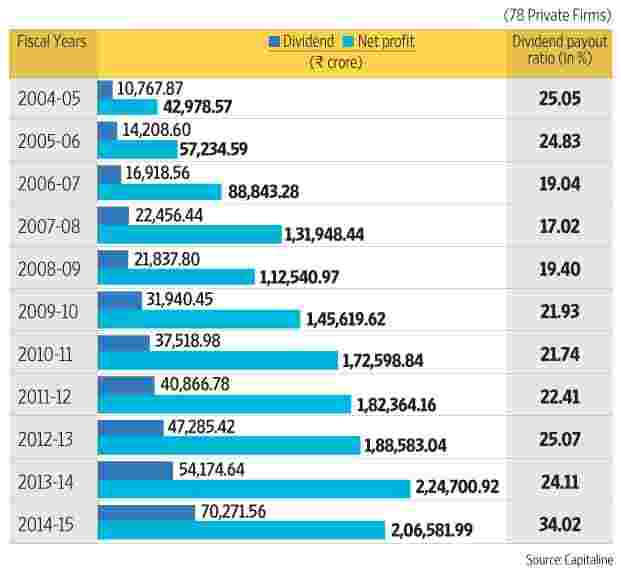 Around 16 private companies paid no dividend in the last financial year, including prominent names such as Tata Motors Ltd and Jaiprakash Associates Ltd. On the other hand, around 12 private companies paid more than 50% of their profits as dividends. Sinha of Emkay Global said public sector units (PSUs) in the finance sector have to pay at least 20% of their profits as dividend, while for other PSUs, this figure is at least 30%. These rules don’t apply if these companies incur losses. “Some also pay special dividend, and these payments are made essentially to fund the government’s fiscal situation. So, even though PSUs’ dividend payout has dipped slightly, it will continue to remain high," said Sinha. “We have noticed dividend payout and fixed investment since 2010 as a percentage of total cash flow has been more than 100%. It means that they used external borrowings to fund part of dividend. Most of these, barring the exception like Coal India, are usually cash-strapped, and this is not a good sign," said Sinha. The top outlier in this space was Coal India Ltd, which paid out 95.25% of its profits as total dividend for 2014-15. The state-run miner has a consistent record of paying high dividends every year.